Christmas this year was very fun... lots of time spent with my beautiful family. TL and I both worked for the days surrounding Christmas, but we had the day off and got to visit with both families! TL and I also got many new wonderful gifts... very exciting! The tree at my parents house... gifts for all 9 of us! Dad making his traditional Green Eggs & Ham and Egg with Rice for breakfast... yum! Breakfast after stockings... we've done it this way every year! 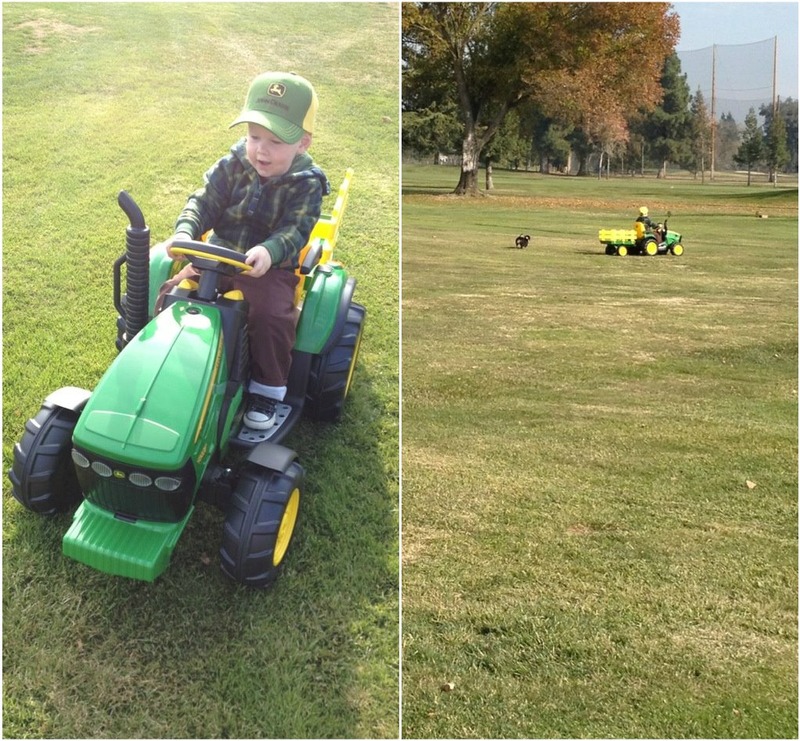 My dad got my nephew a ride on John Deere tractor... isn't this the cutest thing ever? TL's family stayed with us for a few nights... and my whole family came up to our house so we were all together. It was the best part of Christmas! Looks like you had a wonderful Christmas!! And my god that's A LOT of presents! It looks like y'all had a delightful Christmas! I think it's so nice that his family and your family were able to all get together and stay in the same house. I love all of the traditions that you have. And the snuggies are so cute! What a fun and cozy Christmas you had...love your PJ's!!! So cute!!! I thought my grandparents had a ton of presents with 20+ in our fam, but you beat them! And I love your PJs, so cute! LOVE the family picture with the snuggies :) also, what a wonderful breakfast after the stockings! Looks like you had a wonderful Christmas! Sound like a magical Christmassy day! Your dogs is so cute with those pjs. Sounds like so much fun! Those footie PJs crack me up. Glad you had a Merry Christmas, and wishing you a happy new year! Love all the pictures! But especially the last one with y'all in footed jammies. I need a pair of those so bad!!!! OMG.. love the PJ's! And look at all those presents!! I love your family picture!! So cute! 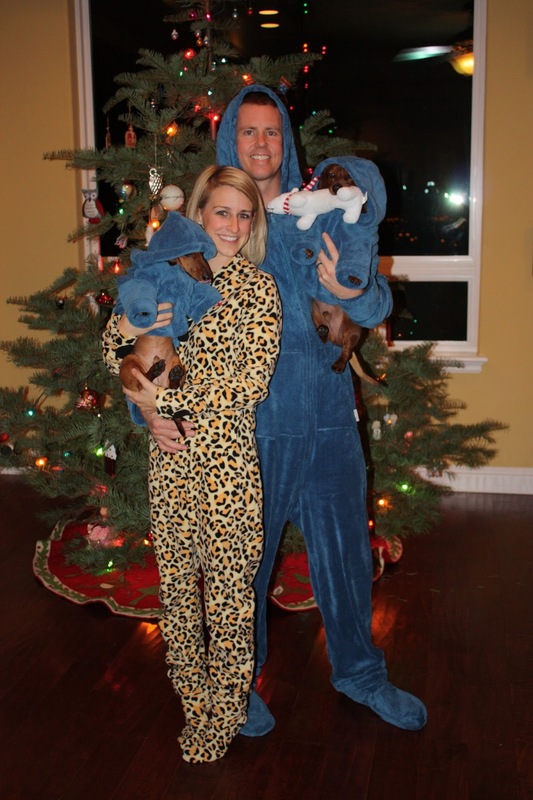 Love the pic with all of you in footy pj's... esp the dogs. that's just the cutest! Haha- love the jammies- too cute!! I love the pictures of everyone in their footie pj's! So cute!! i think i need some of those footed pjs, toO!!! Wow that is a ton of gifts. Great Christmas indeed! i can't get over the tower of gifts! lovely pictures. hahah oh my gosh the pjs for he doggies too cute! Those Pj's are too cute! Looks like it was a great Christmas morning! What a year!!! Love it all! !